In Stock - Ships Same Business Day! 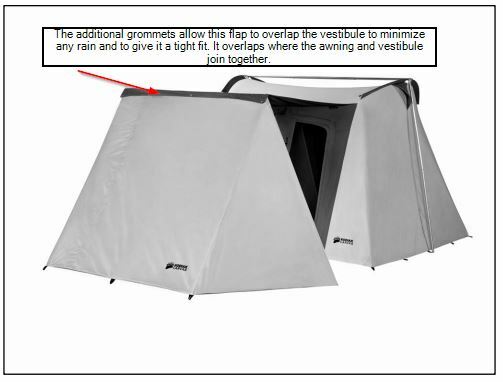 Please note that you must add two additional grommets to the awning of the tent to attach this accessory if you want the awning to overlap the vestibule to protect from rain getting inside. Most customers choose not to do this since rain will generally get inside since the vestibule does not cover the sides completely anyway. The wing vestibule accessory will enhance your awning leisure area by providing additional shade, and protection from wind and rain. 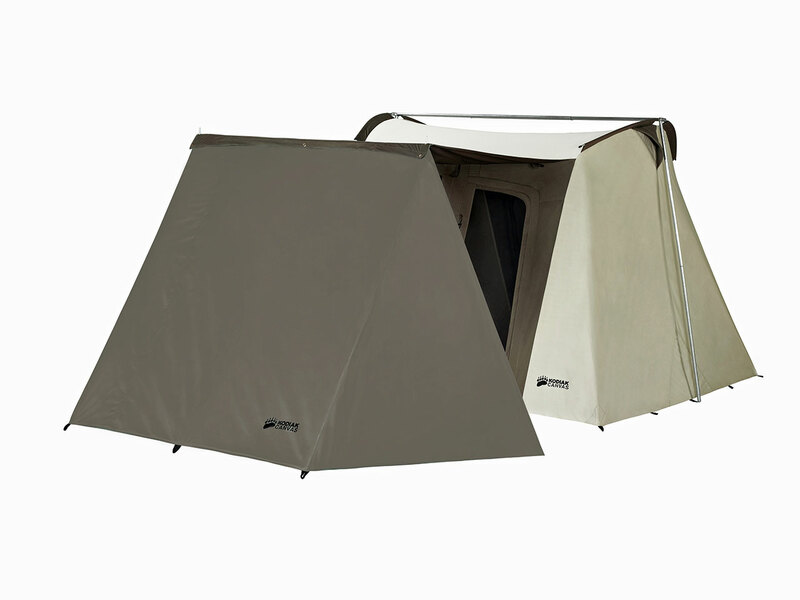 Campers often use this in crowded campgrounds where you can get more privacy. It also is a great place to store coolers, camp chairs, and other camping gear. Tent sold separately. This 1601 listing is only for the vestibule wall that attaches to the existing awning. It attaches underneath the front of the awning and extends out to the ground. Two side wings provide additional cover on the sides. It creates a nice space to store gear, put some chairs, or keep a pet. It also adds privacy if the front windows are open. Made with canvas (polyester, denier cloth was the old model). 6) Position the 1601 wing vestibule so the bottom edge is flush to the ground and taut. Secure with stakes. I added this to my Flex Bow tent new. Spent two weeks camping in Florida 2/17. It performed great. Never leaked in heavy rain and held up in a gale force wind. Provides extra shade too. Nice and heavy not thin easy to uses! Q: Hi,I'm interested in getting this vestibule in the future. 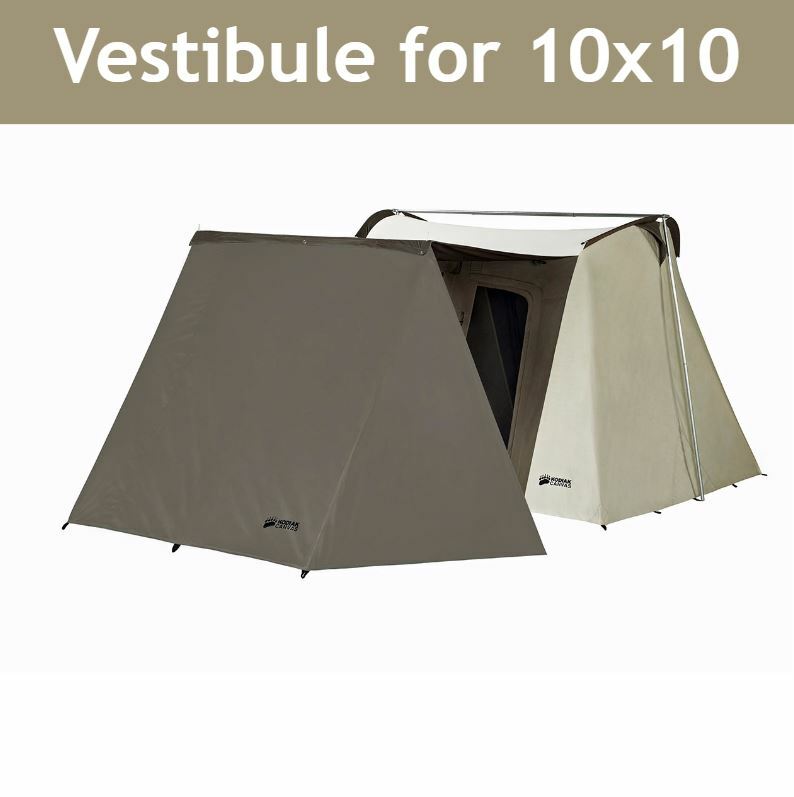 I've just bought the tent and will think about the vestibule after I've tried it out. In fact this is why I decided on the 10x10, so that I'll have the option of a vestibule later. I'm glad it's now available in canvas; however I would much prefer it in the main tent color because I do medieval/renaissance events and khaki was not a popular color in the middle ages. Is it available in any other color? Thanks, G. M.
A: This is the only color currently available. It was meant to match the color of the awning. Q: I'm enjoying the 10x10 VX immensely. 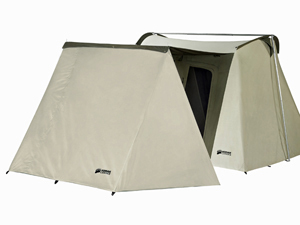 However, I just tried to setup the canvas vestibule I bought with the tent and discovered that I need a 'ridge pole' to connect the two awning upright poles. Was that ridge pole supposed to come with the tent? I did not receive one with either the tent or the vestibule. Any help? Thanks. A: Yes it comes with a telescoping ridge pole. If you did not receive it please contact one of our customer service reps.
Q: Does this privacy vestibule fit a 9X12 Kodiak Cabin tent? A: No, This vestibule only works with the 10’x10’ tents. A: We do not recommend having flame inside a tent. This is a vestibule only, and not a full tent. 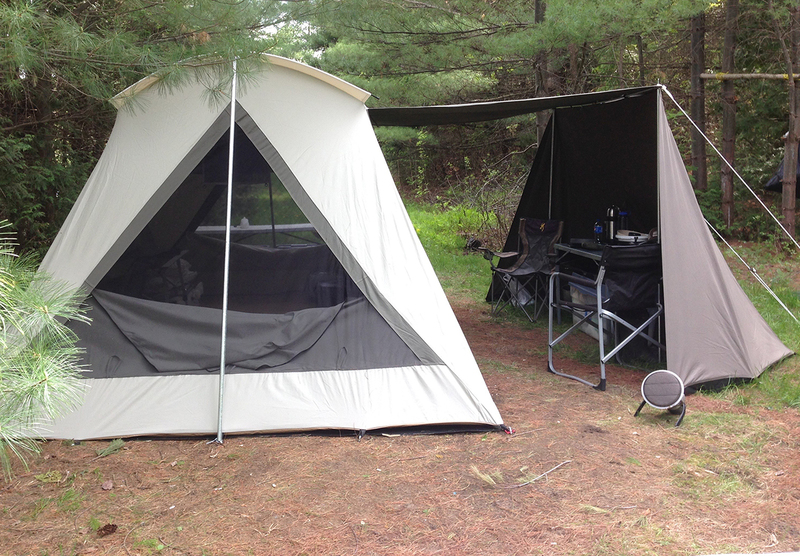 Kodiak Tents are great for all season use, and will stand up well to high winds. These tents will do well for extended periods of time, but they are not intended as a permanent shelter. 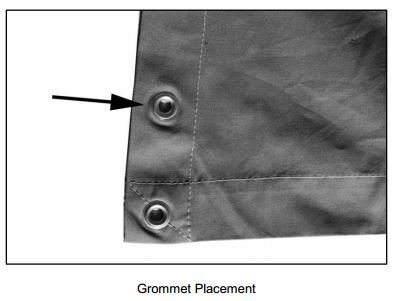 A: The grommets are optional and most customers finally do not need them. The purpose is to overlap the vestibule to protect from rain getting in at the connecting point of the vestibule and awning. However, since this vestibule is not a complete enclosure for the awning (sides are still open to the environment) it isn't completely necessary. If you choose to get the grommet kit we recommend:If you do not have the required grommets kits a do-it-yourself kit can be found at a local hardware store such as Home Depot or Lowes. The model number is 1000030533. 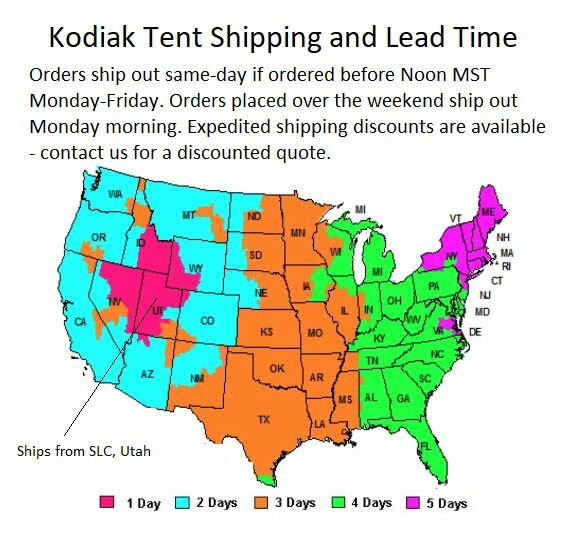 Signing for the Package: We recommend requiring a signature for Kodiak tents shipments. Requiring a signature does not cost you anything extra and is a great way to ensure that you are home to receive the tent. It prevents theft and other delivery address issues. We do recommend that you require a signature. By default no signature is required. If you are interested in requiring the signature this is how it is done. During checkout you will see a link in the bottom left hand corner called Comments. Click on that and type in Please require signature. That's it. Alternatively, please feel free to contact us immediately after placing the order and we can manually require a signature upon delivery. Dimensions: 25" x 24" x 11"